In the Java world, the standard unit of delivery is the jar/war/(x)ar file. For applications which don’t fit the ‘single file’ delivery model, there is no standard alternative. To provide a solution, I will show you how to package your application with Maven as an RPM. The goal we need to execute is rpm – and it attaches itself to the package phase by default – so far so good. This is a very compact way of declaring that we want all dependencies – the dependency tag – and our primary build artifact – the artifact tag – to be deployed to the lib directory of our application. Using location and destination we have absolute control over what is included and where it is placed. Also note the usage of the configuration tag, which translates in to the %config RPM macro, which means that changes to the file are preserved when updating or removing RPM ( details on the RPM %config macro ). Last, we need to generate an empty logs directory for our application. This is done simply by declaring a mapping with no sources. Right now we can build a RPM out of our application. I’ve added hibernate 3.3.2.GA as a dependency, since it brings in a few transitive dependencies. We have reached our goal of building an RPM with our applications dependencies, classes and configuration files. 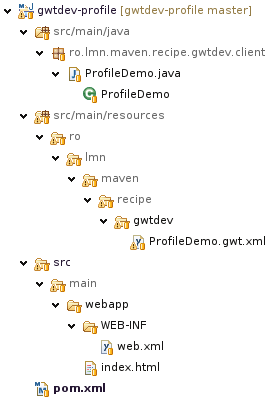 By using the rpm-maven-plugin we have managed to keep using Maven as our build tool interface, and also reused the information available in the POM file for declaring dependencies. The complete source code for this article is available at http://github.com/rombert/Maven-Recipe–RPM-Package . If you have any suggestions or corrections, please comment. Or better yet, fork me. Maven builds follow the “one project, one artifact” rule. This means that although it’s possible to build more than one artifact from a Maven project, it’s not a good idea. It also means that while it’s also possible to build one artifact from multiple projects, it’s not entirely straightforward, and that’s what this post is about. When refactoring a monolithic build into a modular one, often the downstream consumers are not prepared to consume multiple artifacts, so the build still needs to create a single jar with all the classes. This type of change is what I like to call build refactoring, similar to code refactoring. If code refactoring deals in restructuring an existing body of code, build refactoring aims to restructure an existing build. This high-complexity project used to contain two classes, but since they were unrelated we decided to split each into its own module. Of course, we can always use a custom shell command, or an ant file, or even the maven-antrun-plugin to combine the two jars. While easy to do correctly and even in a cross-platform manner, the downside is that we lose the simplicity and modularity of a pure Maven build. While the assembly plugin is well known and used, there are a few considerations which must be observed when aggregating the results of a multi-module build. At this point, we have achieved or goal. By creating a dedicated distribution module, we have isolated the packaging logic from the rest of the project, and used the maven-assembly-plugin to package the non-transitive dependencies, which we declared to be the modules to be packaged. One indirect conclusion of this article is that, although Maven is convention-based and seemingly rigid ( or opinionated , to meet the buzzword quota per posting ), there are often idiomatic Maven solutions which solve unsual problems in an elegant way. The complete source code for this article is available at http://github.com/rombert/Maven-Recipe—Aggregate-Jar . If you have any suggestions or corrections, please comment. Or better yet, fork me.